Club of America Rescue Education). 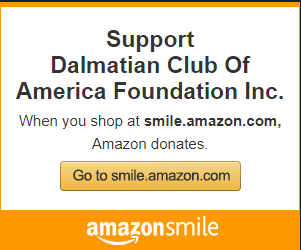 The Dalmatian Club of America Foundation (DCAF) is a non-profit charitable Corporation devoted to advancing the health and quality of life for Dalmatians and all dogs through supported research and education. The Foundation has received from the IRS 501 (c)(3) status. Your contributions to the Foundation should be tax deductible on your federal income tax return. However, each donor should consult with their tax advisor. 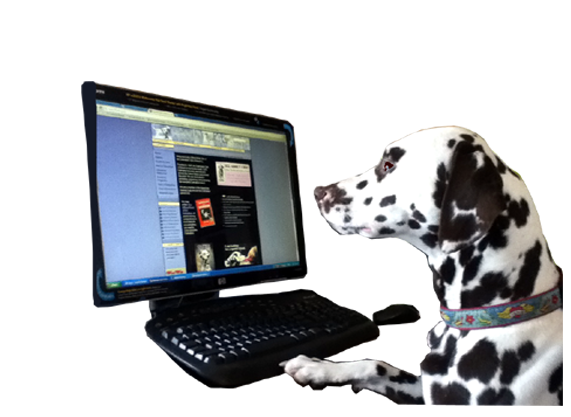 For information about Dalmatians and/or the Dalmatian Club of America, please visit the web site of the Dalmatian Club of America. You may also enjoy the web site of the official publication of The Dalmatian Club Of America, The Spotter. Please share this NEW pamphlet with Dalmatian Owners and your veterinarians! 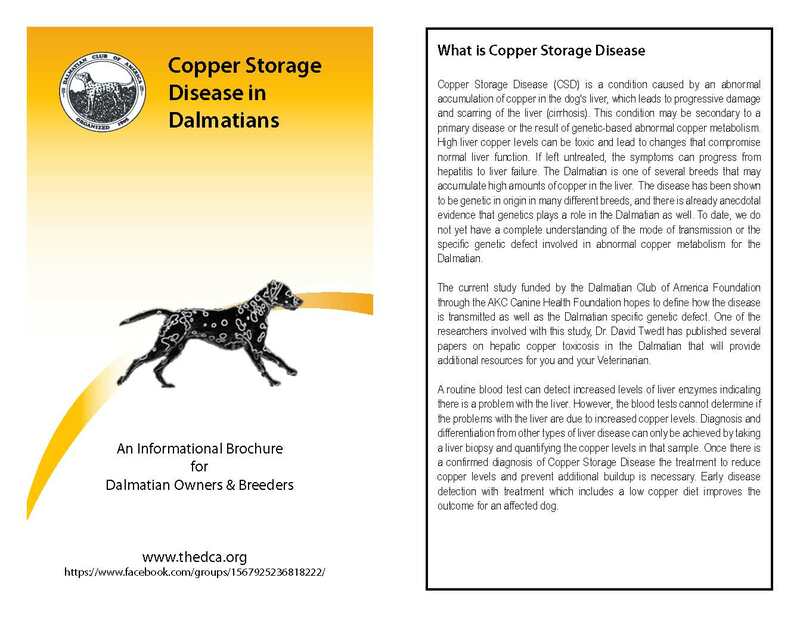 The DCAF & DCA, with the support of the CHF, is sponsoring a study which might help determine if there is an inherited link to Copper Storage Disease in the Dalmatian breed. We are hoping to find the genetic marker and a DNA test for Copper Storage Disease in Dalmatians. More information to come soon. Hepatic Disease Research Study Announcement - Grant period 12/1/2016 to 11/30/2018. 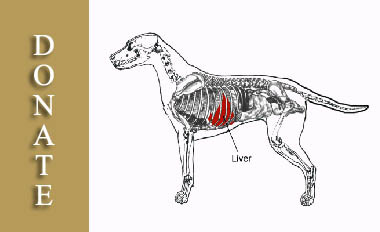 Dalmatians may be at risk of inheriting a rare copper storage disorder of the liver, canine copper toxicosis (CT). CT can be fatal and can quickly spread through a pedigree if left unmanaged. The disease is known to affect several breeds, including the Bedlington terrier and Labrador. The problem genes have been identified in these two breeds. 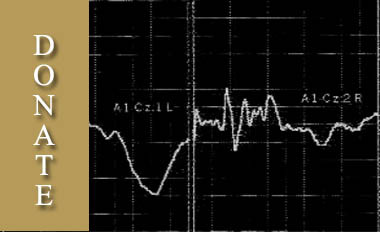 Many dogs respond to copper chelation therapies. So it is important to catch dogs early in their disease process, even before symptoms appear. A genetic test can help identify dogs-at-risk early in the disease process. The test can also help to reduce the spread of problem genes by enabling breeders to make informed choices prior to breeding carriers of CT associated genes. 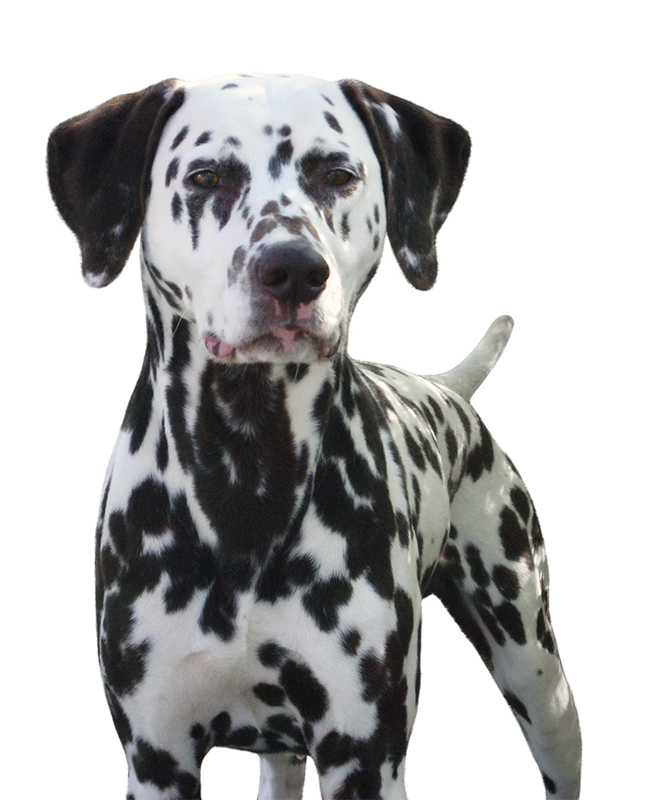 The DCAF & DCA, with the support of the CHF, is sponsoring a study which might help determine if there is an inherited link to kidney disease in the Dalmatian breed. We are hoping to find the genetic marker and a DNA test for Juvenile Renal Disease in Dalmatians. Below is a flyer with information on how you can help if you have an affected Dalmatian. 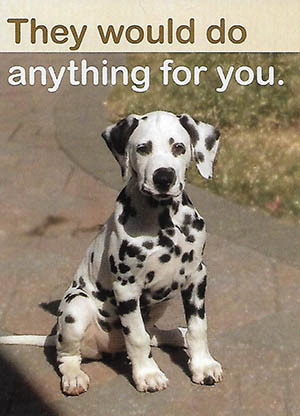 Do you own a Dalmatian that has been diagnosed with kidney disease or is related to one with kidney disease? Click here for Kidney Flyer for information on how you can help. 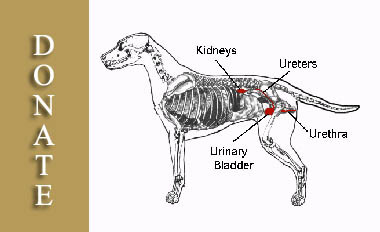 You can also get DNA blood draws on your dog and you can submit them through the Orthopedic Foundation for Animals. 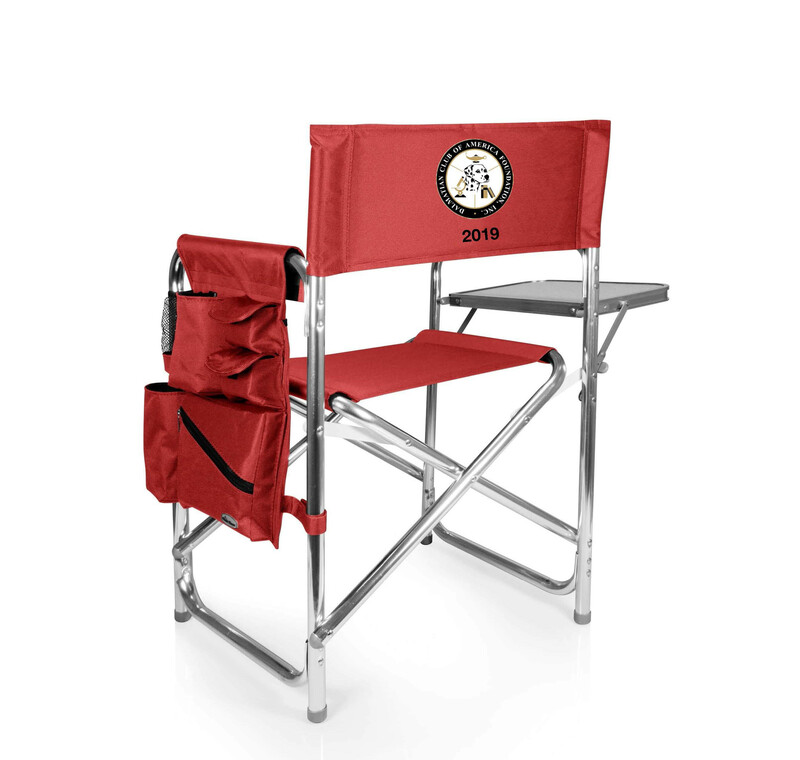 The Dalmatian Club of America Foundation is funding two deafness studies. DCAF in-conjunction with the Australian Cattle Dog Club is funding a study of sibling pairs, where one is bilateral hearing and one is either unilateral deaf or bilateral deaf. DNA samples have been collected from 136 Australian cattle dogs (ACDs) and 237 Dalmatians (Dals), exceeding our original goal of 50 pairs (100 total) from each breed. The assumption that the DNA from litter mates is more similar than that of unrelated dogs, thereby reducing data variability and increasing the likelihood of identifying a causative gene. 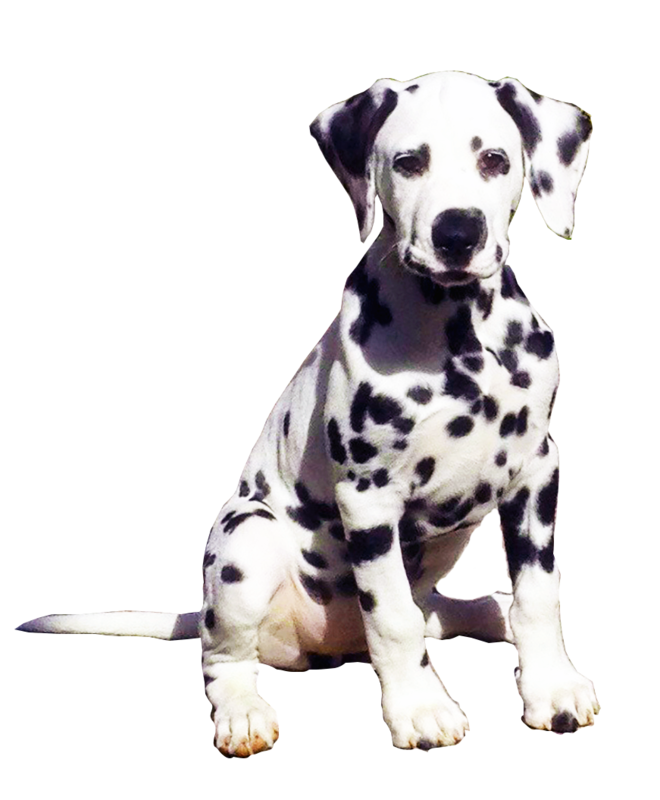 Congenital deafness is a health issue that has higher prevalence in certain breeds, including the Dalmatian. 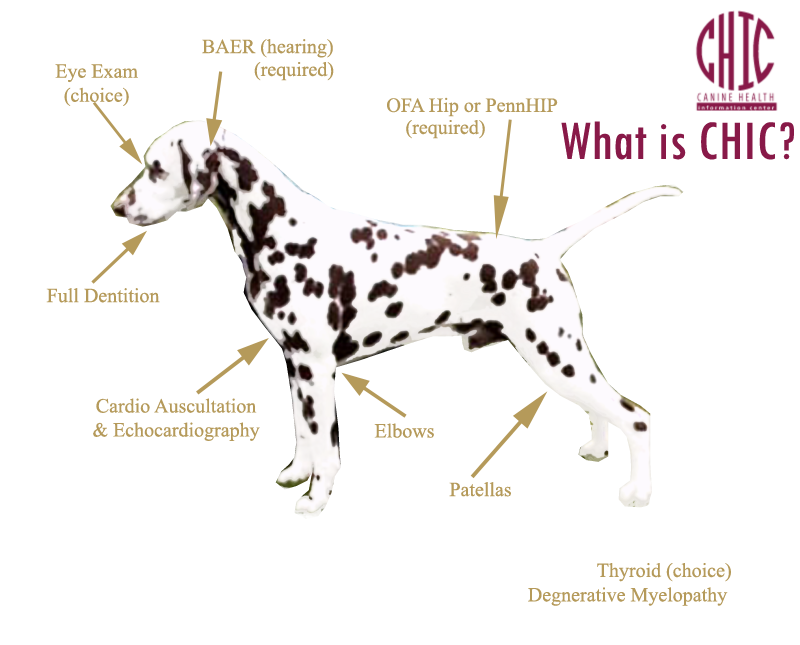 Other studies in this breed have found the trait to be inherited in a complex rather than simple Mendelian manner...The ultimate goal is to identify mutations underlying the trait of congenital deafness in the Dalmatian breed and work towards a genetic testing solution for the Dalmatian breeding community. Click here for more detailed CHIC information as it pertains to the Dalmatian. 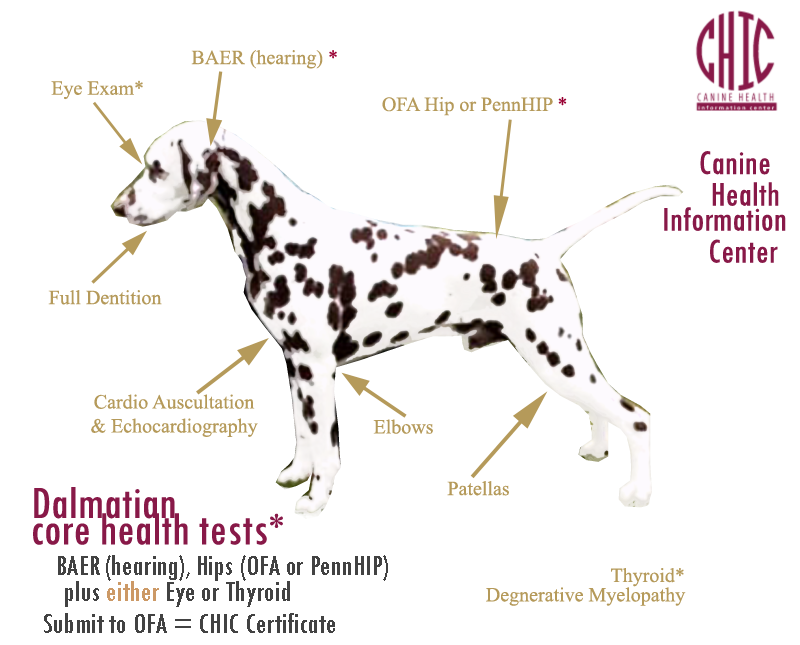 DCAF supports the health of Dalmatians and all canines. Do what you can to help support our breed into the future! Health testing our breeding stock and relatives and registering the results in the OFA CHIC database is one of the best ways to ensure the future of our breed. Use the data to help make the best breeding decisions possible based on past generations. It's up to us to help provide the healthiest Dalmatians we can for future generations. DCAF works in conjunction with AKC Canine Health Foundation to fund canine health research projects. 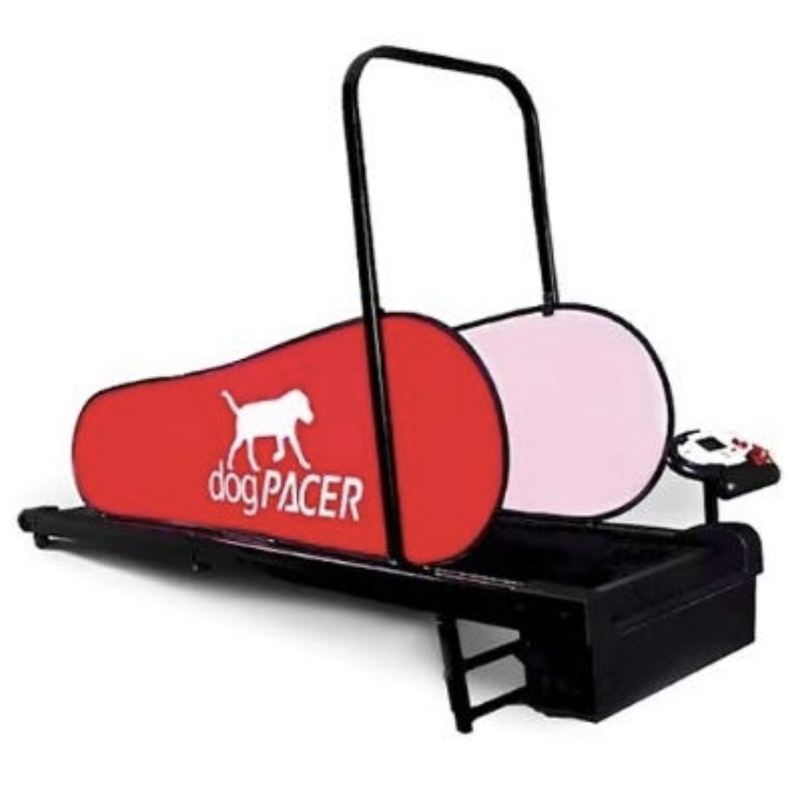 DCAF funds entire litter BAER submissions to the Orthopedic Foundation For Animals and has a Dalmatian Health survey available to owners for submission for tracking health issues and longevity in the breed. DCAF annually underwrites health clinics at our National Specialty. Tests are offered at below market costs and DCAF picks up the OFA submission fees. Click here for the Health Clinics page. Please go to the DCA National Online Store to sign-up and purchase your health tests NOW. The Dalmatian Club of America Foundation has these fundraisers active for 2019! Please click on each one and don't forget to help support healthy Dalmatians by participating or sending us a donation! Your donation can be earmarked for a particular study or go into the general fund. Go to our HOW YOU CAN HELP page to see all the current support opportunities. We are a 503c non-profit organization so all donations should be tax deductible (check with your tax advisor) and count towards your life-time total DCAF Donation Level. YES! I want to return the FAVOR! I want to help PROTECT the breed I love and EDUCATE and promote HEALTH TESTING. Your donation will help in the search for causes and treatment of both genetic and non-genetic diseases. Funding will help sponsor educational seminars, events and health testing and clinics. Click here for Annual Campaign Drive information.